Controlling Live TV is a great thing. When the phone rings (darn those telemarketers) or the dog has to go out, pausing your favorite program seems like a life saver. But sometimes you want to record entire shows for later playback. No reason to rush home for that vital Buffy repeat when your Media Center PC is on the job, ready to record for you. Time shifting is the capability to watch the same content aired on TV, but just shifted in time — so you can record a TV show and watch it when you want. 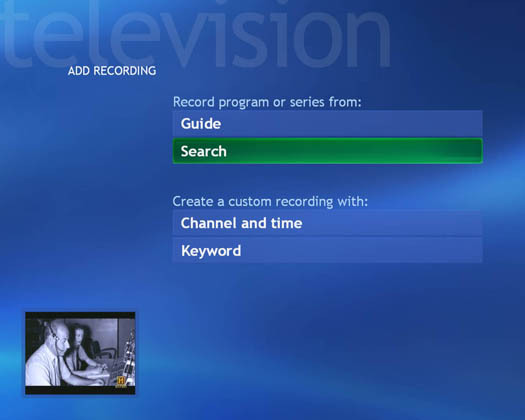 Browse through the Guide, find a show you want to record, and press OK. By selecting the Record menu item that appears on the screen, you can set up the recording. Search for a show in the Guide and set up recording. Manually record (the VCR way!) by entering the channel number and time into Media Center. One-touch record by navigating to a show in the Guide (or even the show you’re currently watching) and pressing the REC button on the remote. After you’ve scheduled a few recordings, you can quickly check what Media Center is planning on recording by going to the My TV main menu, selecting Recorded TV, and then selecting Scheduled. 1. Open My TV by pressing the My TV button on the remote. The screen shown in Figure 1 appears. Figure 1: The recording process starts here. 5. Select the show you want to record. The Program Info screen appears. Media Center saves this recording data in its little computer brain and records the show when it airs. 7. Press the Back button (or any other Media Center function button on the remote) to get back to what you were previously doing. The program you selected for recording now has a little red dot next to its title in the Guide. You can check that you did things correctly by navigating to the show in the Guide and looking for the dot. Media Center checks to make sure that you haven’t already set up a different recording at the same time. Recall that an MCE PC has only one TV tuner and can record only one program at a time. 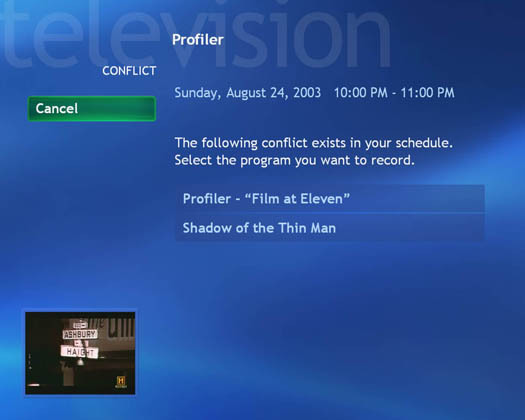 If you try to make your MCE PC record two things simultaneously, a Conflict screen appears, as shown in Figure 2. It’s up to you to make a choice — use the remote to select the program you want to record (this is a little bit of TV triage for you). The other program will not be recorded. Figure 2: Oops! You can’t record two shows at once, so choose the one you want.